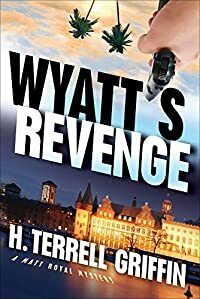 Wyatt's Revenge by H. Terrell Griffin: Synopsis and Online Purchase Options. Synopsis (from the publisher): On balance, retired trial lawyer turned-beach bum Matt Royal is a pretty laid-back fellow. But when Laurence Wyatt, one of Matt's best friends, is murdered, Matt trades in his easygoing ways for a hard-hitting quest for revenge. Matt knows the Longboat Key police will do their job in investigating. But for Matt, finding Wyatt's killer isn't a job; it's personal. Determined to do whatever it takes to solve Wyatt's murder, Matt takes matters into his own hands and embarks on a clandestine investigation. Soon, Matt finds himself in hot pursuit of a cadre of remorseless criminals and trained killers, but the tables turn and Matt becomes the pursued. Faced with mounting danger, Matt calls for backup from his buddies Jock Algren and Logan Hamilton. Matt Royal would go to the ends of the earth to exact revenge for Wyatt's murder, but will he go outside the law?